Are you ready for Halloween? We’re in full Halloween mode here. We’ve had trunk or treats the last two nights, and more fun planned for next week – but we’re getting slammed by a nor’easter this weekend so we’re taking it slower. Which means it’s the perfect weekend for a fun, festive breakfast. When Sue of Palatable Pastime suggested doing a #DeadAndBreakfast event, I was all in. 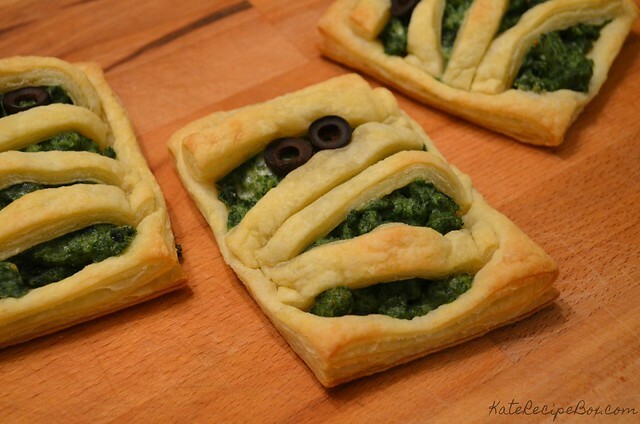 Combining breakfast and Halloween? How can you go wrong! These festive pastries are scrambled eggs with spinach and Mozzarella wrapped up in puff pastry. The spinach gives the eggs the fun green color, but if you’re not a fan you could always leave them yellow – or use a little food coloring. Lightly beat 8 of the eggs. In a blender, combine the heavy cream and spinach until thoroughly pureed. Whisk into the eggs. In a large skillet, scramble the eggs. At the end, stir in the cheese to melt. 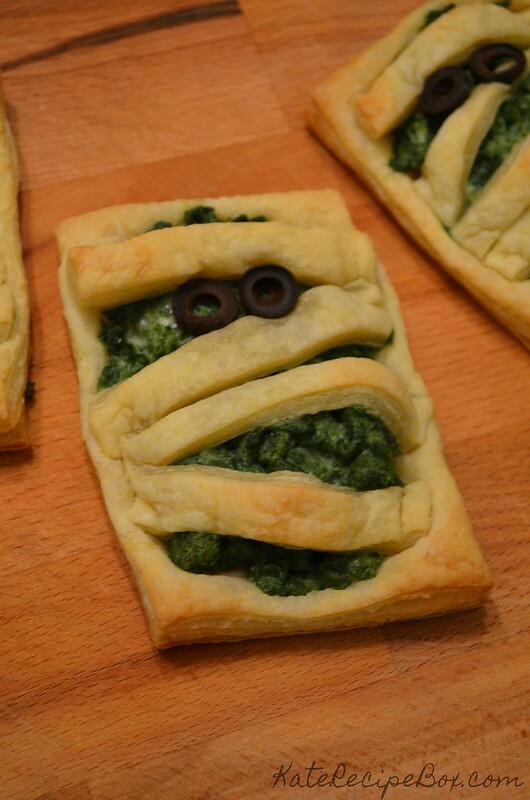 Unroll the puff pastry onto a cutting board and cut each square into 6 rectangles – 12 total. Lay out 8 of the rectangles on a parchment-lined baking sheet. Cut the remaining 4 into strips. 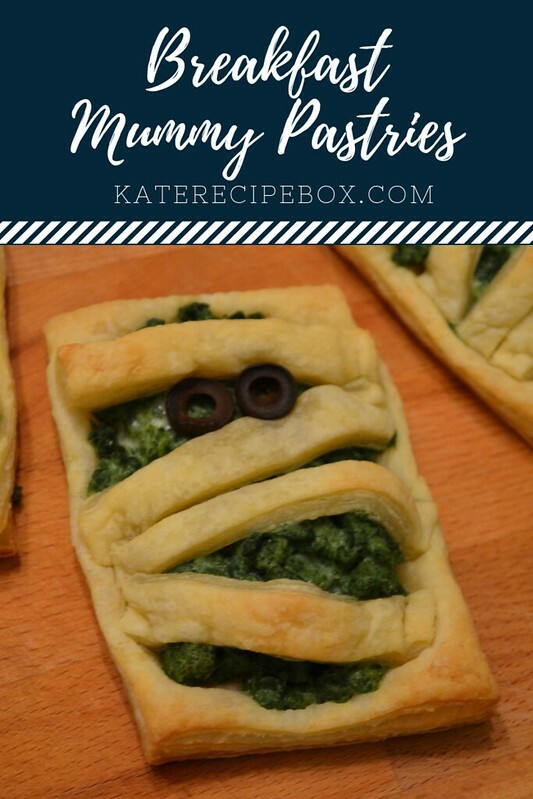 Top each rectangle with the eggs, then use the puff pastry strips to create a mummy-wrap pattern over top of them, pressing the edges into the bottom puff pastry to seal. Beat the remaining egg with water and brush over the top of the pastry. Add olive eyes. Bake for 15-20 minutes, until puff pastry is golden. Serve immediately. As much as I love Halloween, it can be a little hectic. Aside from making costumes, we have two trunk or treats to prep for, the preschool costume parade, and classroom party – not to mention Halloween itself. Oh, and all the “real life” stuff happening this month too. Sometimes, you just need something quick and easy. 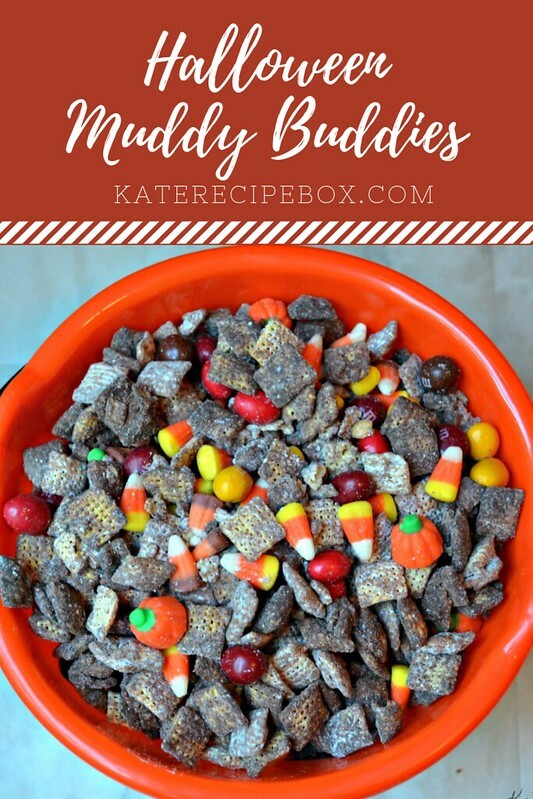 These muddy buddies are quick and easy. 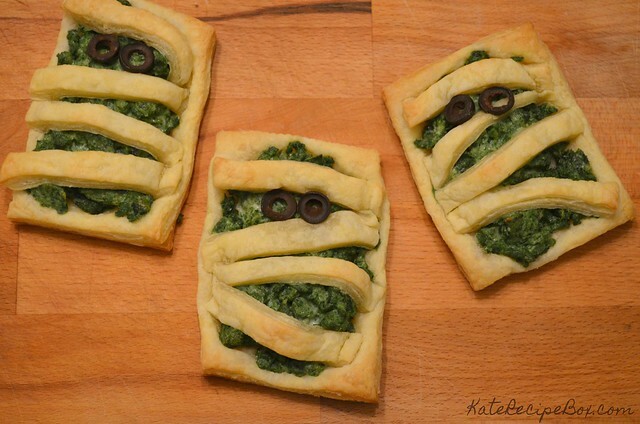 Mix them up in about ten minutes and you’ll be off to your Halloween party in no time. 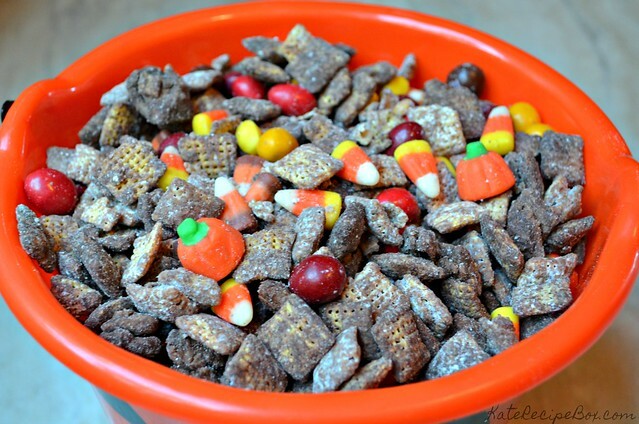 Dump all the Chex in a large bowl. Add the powdered sugar to a gallon-sized ziplock bag. Add the cake mix to another gallon-sized ziplock bag. Set aside. In a microwave-safe bowl, combine the butter and Nutella. Microwave for 30 seconds, stir well, and continue to microwave in 15 second intervals until smooth and creamy. Pour the melted Nutella over the chex and gently stir to combine until all the cereal is coated. Divide the cereal in half. Add half to the bag with powdered sugar and half to the bag with cake mix. Seal the bags and shake until everything is well coated. Pour out on paper towels to rest and cool for at least an hour. 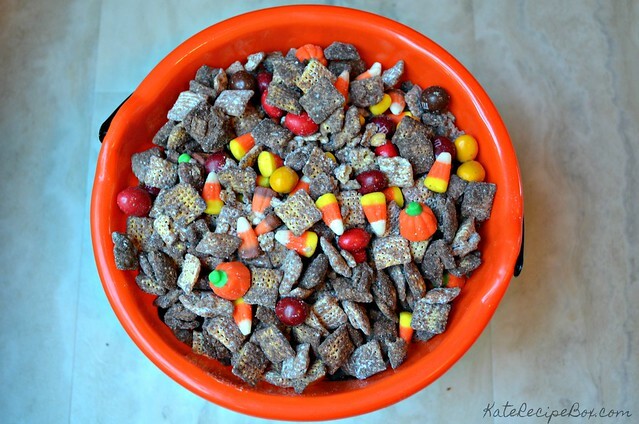 Combine coated cereal with candies and serve.